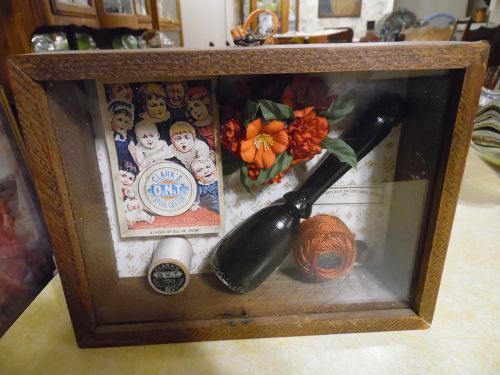 Very cool item for the sewing collector. . 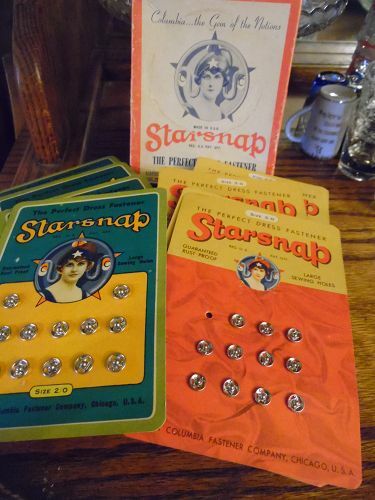 Original box of Starsnap dress fasteners. Size 3/0 and size 2/0. 4 cards of each size. (8 cards total) Only two little snaps missing total. Mfg by Columbia Fastener Company. very cool graphics. 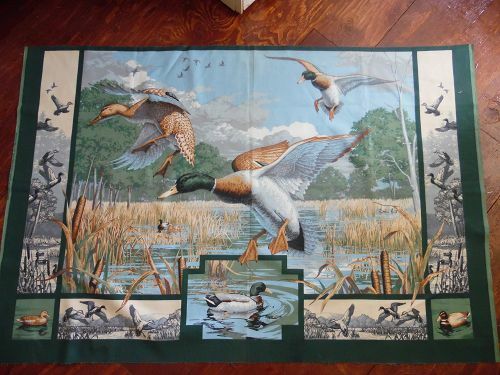 Pretty discontinued fabric panel from the 1990's. Mallard ducks. Measures 30" x 45". 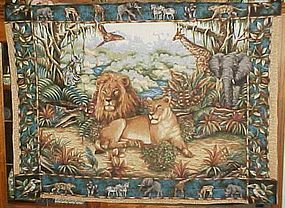 Wonderful project for a quilt center or wall hanging. Vintage Singer sewing Machine hem marker 24"
Vintage skirt hem marker 24" tall. Metal base with nice red Singer sewing machine logo in red and the name also on the chalk box. Just needs the squeeze bulb. 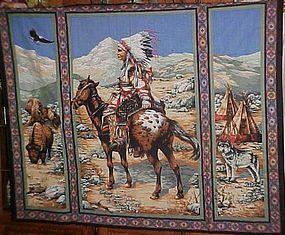 New but older stock Springs Industries printed fabric panel of a Native American Indian Chief on his horse, a buffalo, and his tee-pee village. 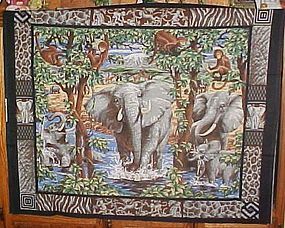 This 1 yd panel would be perfect for creating a unique craft as a large floor pillow, quilt center, wall hanging, or a throw, Just use your imagination and ready-get set-and sew! I have 6 of these panels available. Price is for each 1 yd panel. 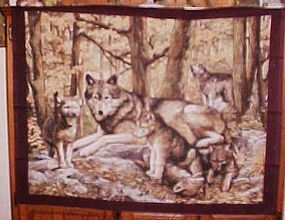 New but older stock printed fabric panel of a a wolf wolves family. 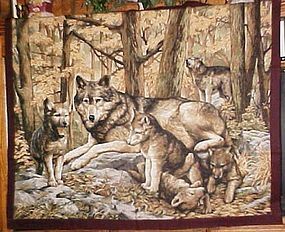 This 1 yd panel would be perfect for creating a unique craft as a large floor pillow, quilt center, wall hanging, or a throw, Just use your imagination and ready-get set-and sew! I have 13 of these panels available. Price is for each 1 yd panel. 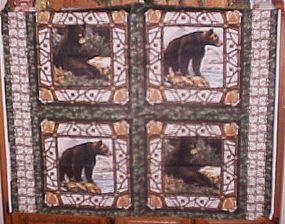 New but older stock Springs Industries printed fabric panel of Montana Black Bear blocks. 4 blocks to this yd. This 1 yd panel would be perfect for creating a unique craft as pillows, quilt blocks, wall art,or something else creative. Just use your imagination and ready-get set-and sew! 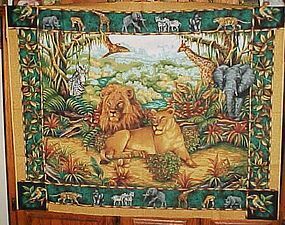 New but older stock Springs Industries printed fabric panel of a Lion family surrounded by other animals in the jungle. 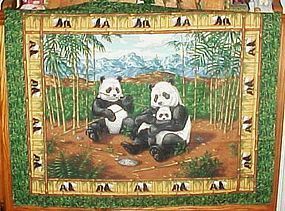 This 1 yd panel would be perfect for creating a unique craft as a large floor pillow, quilt center, wall hanging, or a throw, Just use your imagination and ready-get set-and sew! I have 5 of these panels available. Price is for each 1 yd panel. 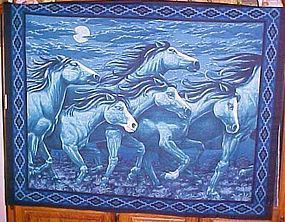 New but older stock Springs Industries printed fabric panel of a stampede of wild horses on a moonlit night. This 1 yd panel would be perfect for creating a unique craft as a large floor pillow, quilt center, wall hanging, or a throw, Just use your imagination and ready-get set-and sew! I have 2 of these panels available. Price is for each 1 yd panel. 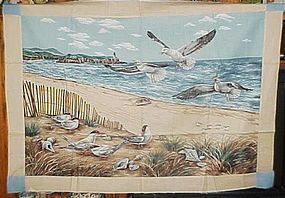 New but older stock 1990 VIP Cranston printed fabric panel of an ocean beach and hovering seagulls. There has been a nice border added on both of these I have (see photo) This 1 yd panel would be perfect for creating a unique craft as a large floor pillow, quilt center, wall hanging, or a throw, Just use your imagination and ready-get set-and sew! I have 2 of these panels available. Price is for each 1 yd panel. 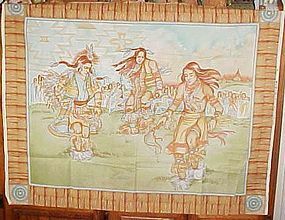 New but older stock 1990 VIP Cranston printed fabric panel of Native American Indian dancers. 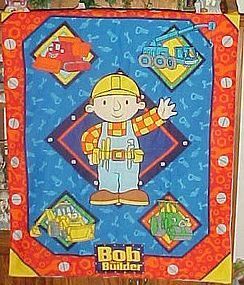 This 1 yd panel would be perfect for creating a unique craft as a large floor pillow, quilt center, wall hanging, or a throw, Just use your imagination and ready-get set-and sew! I have 5 of these panels available. Price is for each 1 yd panel. 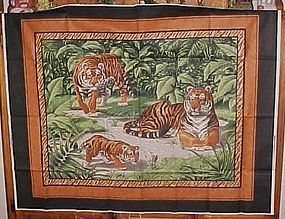 New but older stock 1990 VIP Cranston printed fabric panel of a Tiger family in the jungle. 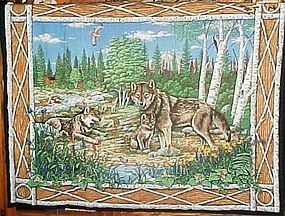 This 1 yd panel would be perfect for creating a unique craft as a large floor pillow, quilt center, wall hanging, or a throw, Just use your imagination and ready-get set-and sew! I have 4 of these panels available. Price is for each 1 yd panel.